Analysis of Kim Jong-un’s New Year Address, Nuclear Doctrine, The Prospect for Peace in Korea? “2017 was a year of heroic struggle and great victory,” said North Korean leader Kim Jong-un as he began his 2018 New Year’s Day address, much anticipated by North Korea watchers around the world. His country, he said, has accomplished the cause of “perfecting the national nuclear forces” and “at last come to possess a powerful and reliable war deterrent, which no force and nothing can reverse.” He then quickly moved on to discuss two other topics in great detail: the country’s five-year plan for economic development and the need for reconciliation between North and South Korea toward national reunification. Two, having gained confidence in its ability to defend itself from U.S. aggression, North Korea appears ready to move onto other important matters, like building its economy and improving relations with the South—two things that will likely be North Korea’s priorities this year. 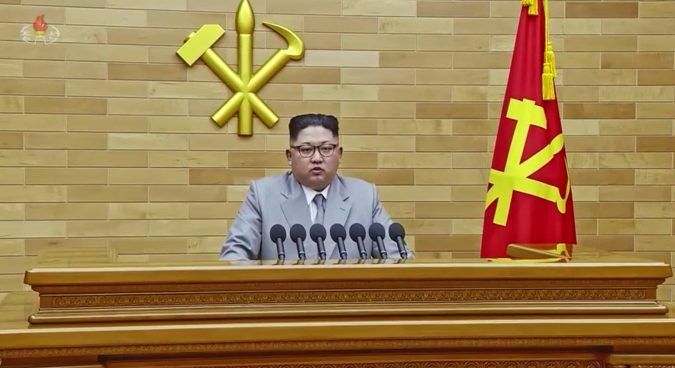 Kim’s New Year address goes into minute detail about the country’s goals in all aspects of its economy, such as the metal industry, the chemical industry, agriculture, and light industry. The western media overlooks this section of the speech, perhaps because it appears to be about domestic affairs that don’t concern the west. But for North Korea, building a self-reliant economy is critical in its fight against U.S. aggression. But the real answer is in Kim’s speech, which outlines in great detail how to make all aspects of the country’s economy self-reliant: how to, for example, train and support scientists so the country can use its indigenous resources and know-how to build an economy independent from foreign powers. Increasing livestock and the production of fruit, mushrooms, and fish—an indication that North Korea’s concern in the area of agriculture has moved beyond just producing enough to feed its people to diversifying their diet. “The United States and its vassal forces and their desperate manoeuvres to ignite a war” are obstacles to national reunification, according to Kim Jong-un. South Korean President Moon Jae-in has always wanted the Winter Olympics in South Korea in February to be an opportunity to showcase North-South unity and had repeatedly requested the North’s participation in the upcoming games. At Moon Jae-in’s request, the United States agreed today to delay the joint military exercise that normally takes place in the Spring to avoid a flare-up of military tension during the Olympics. On Wednesday, North and South Korea reopened a communication channel in the truce village of Panmunjeom after it had been shut down for two years since ousted South Korean President Park Geun-hye unilaterally closed down the inter-Korean industrial zone in Kaesong in February 2016. Why is the prospect of peace in Korea so threatening to those vested in maintaining the US-ROK alliance? U.S.’ alliance with South Korea—and Japan—is critical to its strategic interests in Asia, a region that the previous administration had identified as the center of this century’s global economy in its “pivot to Asia” doctrine. In Northeast Asia, the United States has invested billions of dollars to construct a trilateral missile defense system with South Korea and Japan to curtail China’s power in the region. To U.S. military strategists, South Korea, with a ‘real live enemy’ to its north, provides an ideal training ground for its forces, which routinely conduct massive exercises that simulate real war scenarios and involve tens of thousands of troops from the region as well as the continental United States. South Korea is also among the top purchasers of U.S. weapons, a major source of earning for the United States. In the past decade, the United States sold more than $30 billion worth of weapons to South Korea. For the U.S. military industrial complex, a divided Korea perpetually threatened by war is a bonanza. And the continued division of the peninsula is critical to keep it that way. In short, what the United States seeks, in the name of the “US-ROK alliance,” is to turn the Military Demarcation Line that separates North and South Korea into a permanent border. 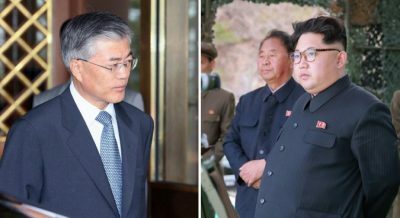 Even as Moon and Kim take cautious steps to resume North-South contact, we can be sure that the wheels are already turning in Washington to undermine this effort. Former human rights lawyer Moon Jae-in has said he wants South Korea to be “able to take the lead on matters on the Korean Peninsula.” 2018 will be a test of his determination to see his vision through. The South Korean people, who, just one year ago, took to the streets in the bitterest winter months to say, “Basta ya!” accomplished something no one had previously imagined possible: the ouster of the dictator’s daughter, Park Geun-hye. 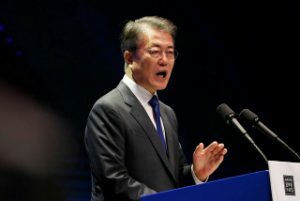 They can, once again, achieve what had once seemed out of reach by pressing the Moon Jae-in government to fulfill his vision—use the Winter Olympics as an opportunity for a breakthrough toward lasting peace and national reconciliation in defiance of the U.S. military industrial complex. To that end, peace and anti-war forces in the United States, too, need to press their own government to give South Korea the room to chart its own course. This article was originally published by Zoom in Korea.